This post originally was written by Dr. Zuzana Mészárosová and published on Učiteľské Noviny" (or translated, Whiteboard Newspapers") on August 28, 2015. This post is the translated version of the original Slovakian post. The tool used was Google Translate. For the original piece, please follow this link. This article has been re-presented with the blessing of the author. TED (Transatlantic Educators Dialogue) is a program generously sponsored by the European Union Center and the College of Education at the University of Illinois in Urbana Champaign. Testimonials such as these prove the value of the program, and demonstrate the benefits of being involved in the program. If you are interested in the program and would like more information, please visit the webpage for TED. TED (Transatlantic Educators Dialogue) is a program of the American University of Illinois, which brings together experts in education in the US and Europe online and experts exchange practical experiences and discuss various educational topics to detect each other. The discussions American and European educators conducted nearly half a year online and on the final day the graduates received certificates. BRATISLAVA - The types of educational diplomacy with education experts ensures that they take into account different aspects in the debate, discussion on education systems in the countries participants in the debates, as well as overcome many cultural barriers, misunderstandings and misconceptions. TED 2015 is the fourth annual overseas debates about education. Online collaboration is carried out once a week. The coordinator was Lucinda Morgan, from the University of Illinois. Interaction with the Blackboard platform was used, and technical support was available from the American University. Moodle was used to exchange experiences between the parties, including discussions, debates and dialogues. All equipment and works that were created in the course of cooperation continue to be available to participants. All participants worked in groups of eight. Each group worked independently and prepared a joint presentation and supporting materials. Americans working in the group worked on the topic of "Technology in the classroom," and we presented a vital project of European Schoolnet - eTwinning. During the next presentations and debates, teachers learned a lot of new information on education systems in different countries of the participants of TED, various approaches, methods and forms of teaching, assessment and debate about the impact of immigration and migration, education and diversity, education in rural and urban areas, the international cooperation, and the future of education. One of the results of TED cooperation was meeting some participants from TED 2015 on 27 June 2015 in Brussels, where they shared further exchanges and shared experiences. 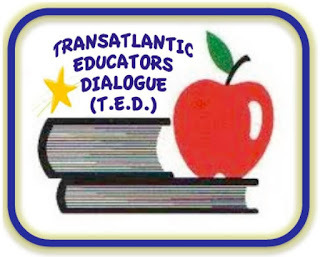 Transatlantic Dialogue Educators was an invaluable experience and provided benefits of online collaboration for every attendee. It was a great place for open debate and mutual comparability of education in Europe and overseas, as well as the professional development of teachers participating.